Philadelphia’s Franklin Institute recently opened the most significant expansion in the museum’s history. Alcorn McBride’s ProTraXX and VCore controller played key roles in “Your Brain,” a high profile, permanent exhibition. Entertainment Lighting Services (ELS), supplier and integrator of lighting and staging equipment, as well as a full range of production services, provided the gear for the signature exhibit housed in The Nicholas and Athena Karabots Pavilion. Alcorn McBride’s ProTraXX and VCore controller played key roles in “Your Brain,” a high profile, permanent exhibition. “Your Brain” is the largest exhibition in the country dedicated to the most complex and misunderstood vital organ in our bodies. It features more than 70 interactive experiences, including a two-story climbing structure that simulates a neural network with dynamic lighting and sound effects triggered by footsteps. 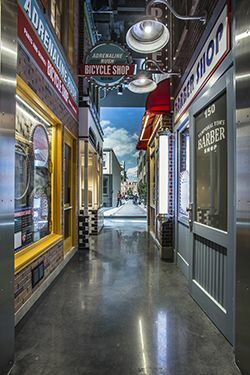 A street scene area enables visitors to travel through a scenario filled with multi-sensory information and scenes from everyday life. Street scene takes visitors on a walk down a small-town Main Street where they see and hear typical sights and sounds. “Alcorn McBride’s ProTraXX supplies audio effects playback on a loop that the sound designer Karin Graybash and ELS tech Chuck Schoon worked through and programmed,” said Prado. “It’s a pretty straightforward application” for the compact, solid-state MP3 playback unit. Located in the heart of Philadelphia, The Franklin Institute is renowned as a leader in the field of science and technology learning and is Pennsylvania’s most visited museum. The new 53,000-square foot, $41 million Nicholas and Athena Karabots Pavilion, named for its lead donors, opened to the public on June 14. The Frank Baldino, Jr. Gallery in the Nicholas and Athena Karabots Pavilion houses the museum’s largest permanent exhibition, “Your Brain,” plus a traveling exhibition gallery, and a conference and education center.